Allowing Jeff Sessions to reverse nearly a decade of progress made on mass incarceration, singlehandedly walking back our changing status. 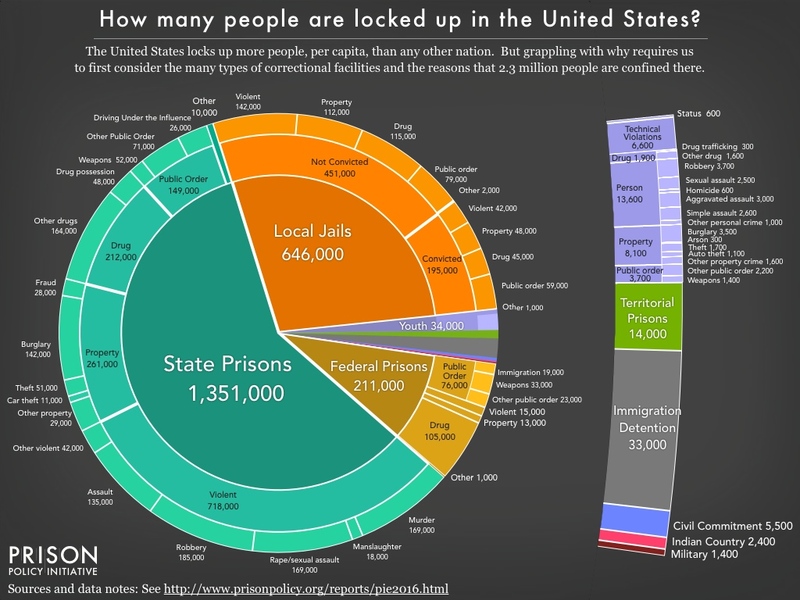 At the end of 2013, the United States represented about 4-½% of the world’s population, yet housed just over 20% of the world’s prisoners. Non-violent drug-offenses account for 20% of our total prison population. With a privatization of the prison system, more prisoners mean more money in someone’s pocket – a system rife with kickbacks. How does this serve to end economic, racial and ethnic disparities in our criminal justice system? Contradicting, with false statements, all credible scientific evidence of global warming and climate change, in order to undermine our relationship with other developed and worldview nations, pulling us out of a global accord set up to improve the air and water quality of the world for future generations (your grandchildren and beyond). This Bannonian statement interesting for two reasons. First, please note, business came first in Trump’s mention of “being fair.” But more importantly understand: the guidelines of the Paris accord are voluntary – they were never mandatory. California, the sixth largest global economy, has been ahead of the game, and they will continue to reduce carbon emissions regardless of the lies emerging from the White House. CEOs of Goldman Sachs, GE, Exxon, and most of Silicon Valley all said staying in the Paris Accord and reducing carbon emissions is good for the economy. Second, if our President wants to protect America and its citizens from “Draconian financial and economic burdens,” he might want to reexamine his own budget and his party’s AHCA. Yes, 38% of the country supports this President. And we all want American to be great, but not at the expense of everyone else in the world, or at the expense of our future. After all, God made us guardians of our planet, not defilers of it for the almighty dollar, with no responsibility. I think that’s what’s so exhausting about the whole thing, Lilka. Every day. It never seems to end – and so many are turning a blind eye to this war against honest and integrity. Particularly those who spit such vitriol against anything they claimed President Obama or Hillary Clinton did that was out of integrity. Now, these same people accept whatever the White House and the President does. In my view is it grossly hypocritical. A powerful post, Susan. Thanks for putting it together and gracing it with words that carry truth without apology or fear. I can no longer be afraid to speak up; it is like being afraid to speak up or take a stand to school yard bullies. We must speak up and tell the truth, no matter the cost. Absolutely–and, as in your post, without mocking or belittling anyone. Just telling the truth that can set all of us free. As often as needed. I strongly disagree Susan. President Trump is just undoing some of the stuff the other venue got us into. I think he is doing a great job. Praying for and supporting our president. It’s all very scary. We have to believe God is bigger than it all. I stopped watching the news because I just can’t bear it any longer! It is only scary until you realize, as you said, God is bigger, and other wise and developed countries are not allowing themselves to be bullied by our leader. They are banding together and will move forward for the good of the world whether this president tries to isolate us or not. And I will be looking forward to Jim Comey’s testimony this week.